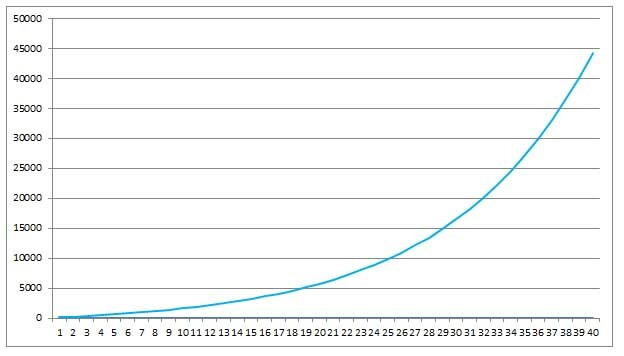 Home » Investing 101: What is Compounding (Compound Interest)? 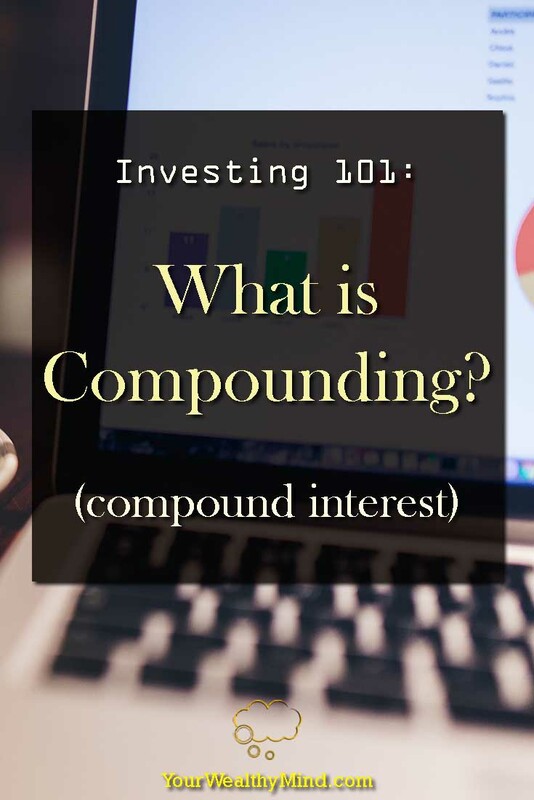 Investing 101: What is Compounding (Compound Interest)? While browsing reddit, somebody asked about investing in mutual funds through PM and I tried to help them as best as I can by providing information that I know (like my previous articles on it). While I was chatting with one of the redditors, they asked me how compound interest works on funds and stocks. I answered that it doesn’t directly work that way as most investments are affected by the quality of the company and the markets movements. Compounding, however, is a good way to explain why you should invest early, and invest often in excellent assets if you want to earn a lot over time. First off, some basic math. Let’s say an amazing investment* earns 10% compound interest per year. If you have $100 in that investment, you’ll earn $10 a year. If you have $1,000, you’ll earn $100. Now, earning $100 a year is much better than earning $10 a year, right? *This is just for example. 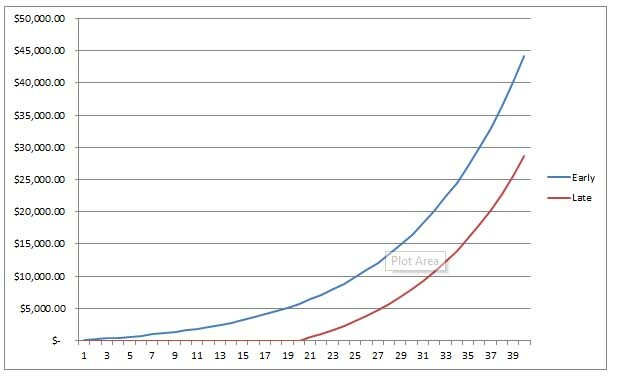 An investment that consistently earns that much compound interest year after year is really rare (and if some claim that their investment is that good or better, it might be a scam). Of course, there are exceptions like AFPSLAI, but that’s a special case. Let’s say you had only $100 invested. That will earn $10 after the first year. If it’s just simple interest, then based on the initial principal ($100) it will only earn $10 on the second year and every year after that. Fortunately, since it’s compound interest it will earn from the initial principal AND the $10 interest it earned from the previous year. The investment which is now $110 ($100 + the $10 last year) will now earn $11. You’ll then have $121. On the third year, your $121 will earn 10% which is $12.1. That’ll give you a total of $133.1. A $121 investment earning $12.1 a year is a far cry from that bigger $1,000 investment earning $100. Fortunately, there’s good news. If compounding continues, that tiny $121 investment will eventually grow to $1,000 and more! After a really long time, it can become $10,000 or bigger! Supercharge compounding by investing more! You’ve seen what happens to leaving $100 alone, now let’s see what happens if you keep adding $100 to your investment every year. On the first year, you’ll have $100. On the second year it earns $10 and you add an extra $100 for a total of $210. 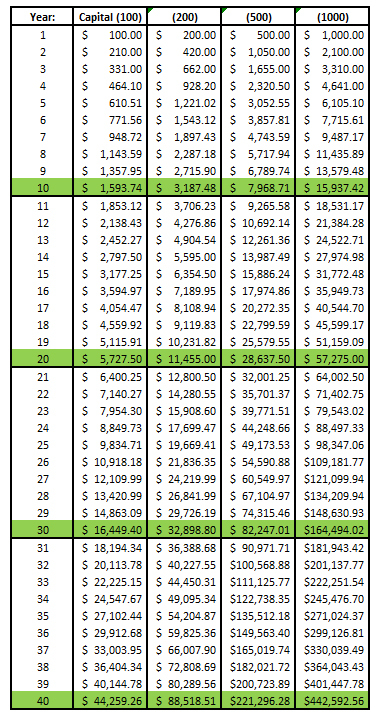 On the third year, the $210 will earn $21 and you add another $100 so you’ll have a total of $331. And so on. It also gets better if you use larger amounts. Let’s use $200, $500, and $1,000 as examples here. See how much faster it grows as the capital increases? Here’s one thing to remember though. It’s much better to start small and start early than to invest big amounts later on. Compounding works FAR better the longer you let it grow. Here’s what investing $100 every year for 40 years looks like compared to investing, say, $500 every year but only for the last 20 years. Think about that last one. 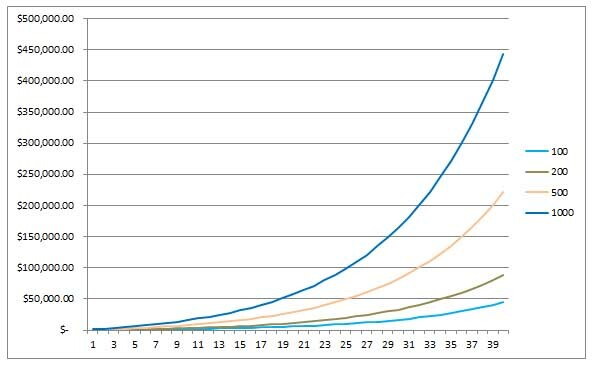 The one who invested $100 every year for 40 years used a total of $4,000 and gained over $44,259. The one who started late yet invested five times more ($500 a year) used a total of $10,000 and yet they only achieved around $28,637. That’s why it’s so important to start early. Don’t wait until you get promoted or get a raise. 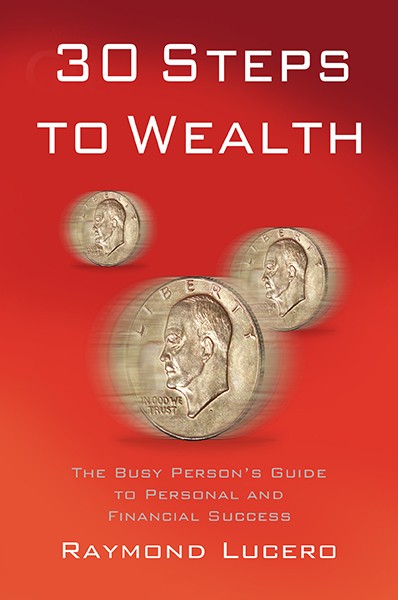 Learn how to save and handle money wisely, learn how to choose excellent investments, and start investing NOW! Here’s one thing to remember and I can’t stress this enough. That consistent 10% compound interest was only an example and most good investment vehicles don’t work that way. Investing in assets like great companies’ stocks, bonds, mutual funds, real estate, or any others will NOT give guaranteed compounding returns. They simply move similarly. While there are “safer” investments that give near consistent compound interest rates like time deposits/bank savings, and debt instruments like bonds, they usually give very low returns and there is still a very small chance that they’ll fail. Again, the value of investments are mostly affected by how well the company does (for stocks, mutual funds, etc. ), how well the market does (for index funds, real estate, gold, silver, etc. ), and how the investment is valued in the market. Now let’s take the PSEi (Philippine Stock Exchange Index) for example. According to Bloomberg, it’s “a capitalization-weighted index composed of stocks representative of the Industrial, Properties, Services, Holding Firms, Financial and Mining & Oil Sectors of the PSE.” In short, it’s a collection of stocks representing almost the entire Philippine stock exchange. This is how the PSEi looks from Jan. 1995 to November 2017 (the time this picture was taken). If you invested in an index fund replicating the market, that’s how your investment’s value will move. You can check the Jan. 1995 to present data through the Marketwatch website here (beside Advanced Charting, instead of 1D or 1 day, remember to use “ALL”). Take note that there are times when the market crashes. That can happen to even the very best investments and companies. Check out the red arrows here. Just remember though that if it’s an excellent investment (i.e. the company still does business well even though its stock price crashes), it’ll likely regain and increase in value especially over the long term. If it’s NOT a good investment, it’ll likely lose more value. I’ll say it once again, there are never any guarantees. Who knows when another red arrow incident (market crash, etc.) will happen. Either way, it’s better to have started investing than to never have done it and find yourself completely broke and penniless after retirement. Plant the seeds for a prosperous future starting today. By learning how to handle your finances well and investing, you’ll learn how to avoid terrible money problems in the future. You’ll thank yourself for it later on. What’s the Best Investment for Beginners?